Pin it! 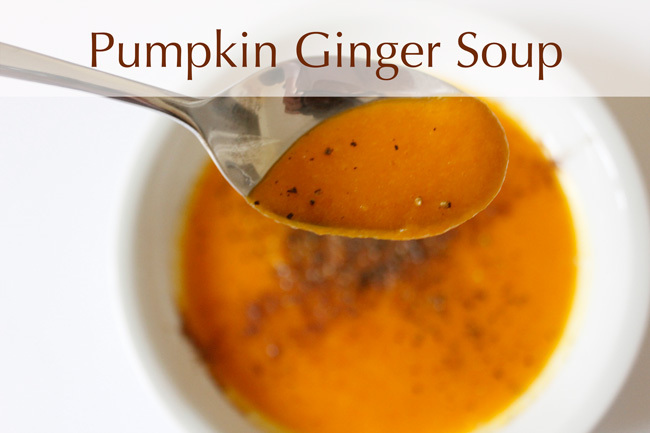 Pumpkin ginger soup recipe. It's pretty safe to say that pumpkin reigns over fall food and drink, so I was eager to experiment with it this season. I've never had pumpkin that wasn't from a can (is that weird? ), so it seemed sort of daunting to me to use the real deal. I realize now that I never should've wasted any time worrying about it because this hearty, healthy soup was so easy to make and so satisfying on a cold fall day that I've made it three times since. Hope you enjoy it as much as I did! Put the pumpkin, broth and cinnamon in a pot and bring to a boil. When it boils, simmer over medium heat for 20 minutes, or until you can easily pierce through the pumpkin with a fork. Transfer to a high powered blender, add ginger, and puree until smooth. Serve immediately with salt and pepper. PS- Pumpkin pancakes, spicy vegetarian chili, and egg-free beet brownies.